Despite my ever-growing collection of half marathon times and medals, my marathon experience remains limited. I’ve only run two, both of them in Chicago. My first was in 2009, after a perfectly mild summer that allowed for easy training. The race itself was very cold, which I enjoyed. I ran conservatively, lost all energy around mile 23 and though I was aiming for under 4 hours, I didn’t groan at my final time of 4:03:21. In 2010, I upped the ante, training harder, faster and longer. I went into the race with high hopes, my confidence practically leaking out of my ears. But to my chagrin, temperatures spiked that weekend. I started fast, lost all energy around mile 18, got cramps in both legs and ended up dragging myself across the finish line in 4:05:22. It was slower than the year before, but I couldn’t call it a failure, especially when others’ times had suffered by more than just a scant two minutes. But I still felt robbed. I had put in the time and long runs necessary to dominate that marathon, but I came up short. 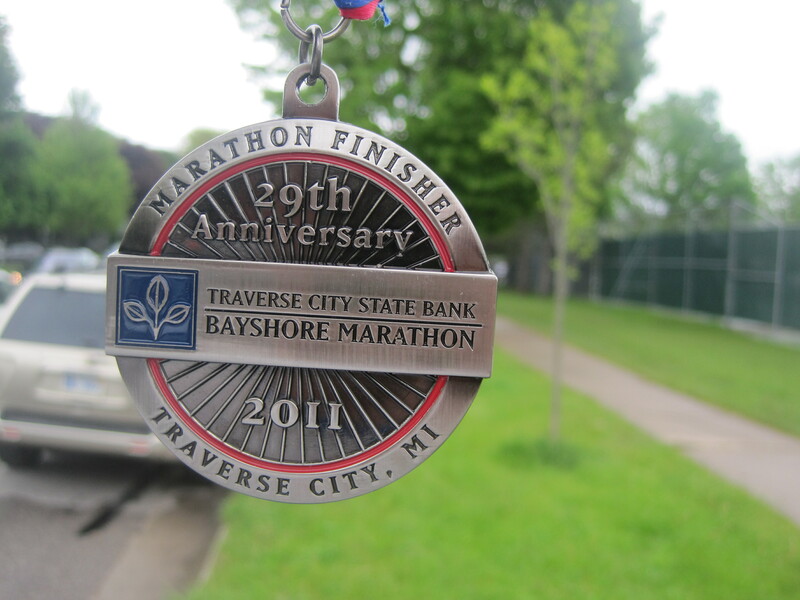 Over two years before I attempted my first 26.2-mile run, everyone’s favorite anthropomorphic marine mammal ran the 2007 Traverse City State Bank Bayshore Marathon. 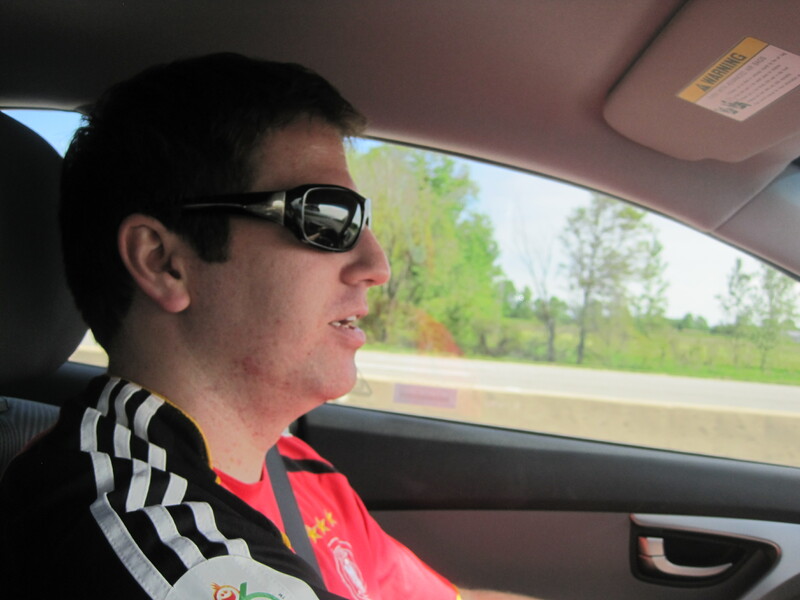 He also did not train for it and loathed the experience. However, Otter still returned the next year in better shape, but still without having gone through what we would consider the typical hoops of marathon training. Although he improved his time by almost an hour, he finished and thought, Never again, screw this. Then, sometime over the last two years, something went off in his head. I can’t accurately pinpoint when it happened, but he began to feel that sudden impulse, that nagging desire to race and collect bibs. Maybe it was a motivation to improve his fitness; maybe racing was the carrot (or burger) at the end of a stick, keeping him focused. Maybe it was that unmatched feeling of accomplishment when you cross the finish line, regardless of the distance. But after I finished the Chicago Marathon in 2010, he told me he was going back to Traverse City for a third run. And just like that, so was I. We drove out to northern Michigan on Friday morning, putting our Hyundai rental car on Otto-pilot and reaching the coastal town in five hours. After some slight hiccups with hotel accommodations, which Otter details in his own recap, we settled in one of the seventy thousand motels the city had to offer. Packet Pickup was at the Traverse City Central High School gym, where we met up with Otter’s college friend Luke and his wife Jamie. Together with Jamie’s dad, we drove a few miles out of the city to eat dinner at Boone’s Long Lake Inn Restaurant, where we sat outside and breathed the crisp, Michigan air. This is what the majority of the run looked like, but with fog, clouds and a few spectators here and there. Race morning was chilly, but dry. We had been tracking the forecast all week, paying particular attention to the indecisive showers that were looking to enter the area. The night before, most websites were giving it a 50% chance of rain. By the time we reached the starting line at Northwestern Michigan College, it had started to come down, though not badly. Fortunately, it went away as runners took off towards the shore, leaving us with a cool mist and cloudy skies. The race heads directly east, reaching Birchwood Avenue, a residential street right on the coast. 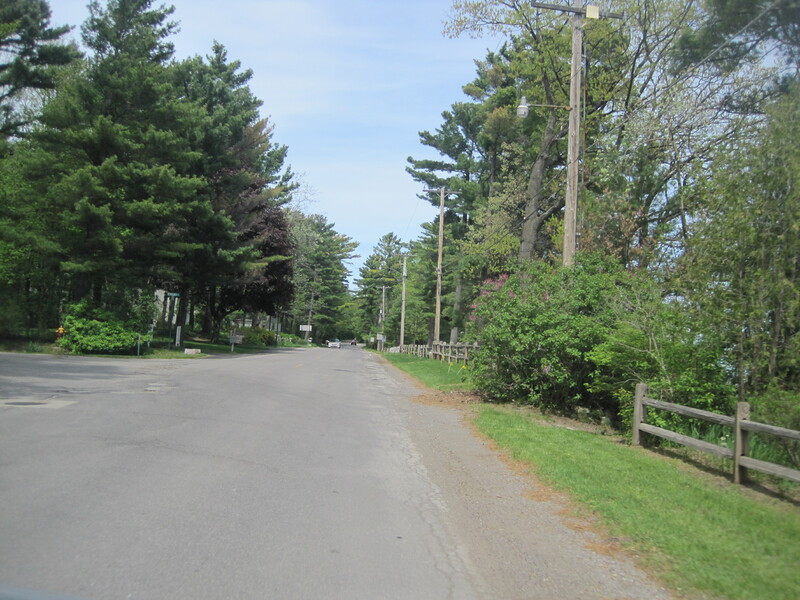 Birchwood eventually becomes East Shore Road, which merges into Center Road, then changes to Bluff Road North. 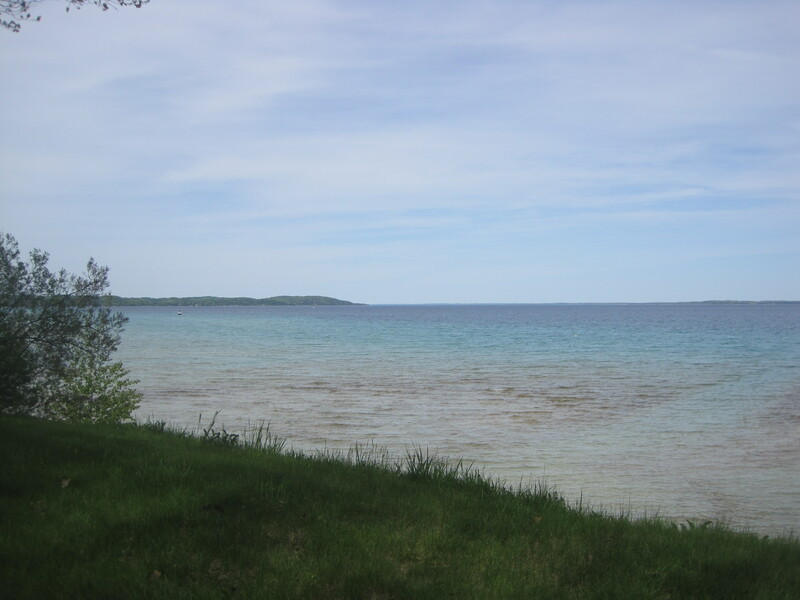 Basically, the course overlooked the Grand Traverse Bay the entire time, due north, showcasing picturesque houses and lots of trees the entire way. It went 13.1 miles, turned around, and came back on the exact same path to the finish line at the college’s track. I’m usually more descriptive of race courses, but there’s literally nothing else to say about it. It was pretty, scenic and drenched in morning dew. Scenic and pretty, but very unchanging. I suppose this race was a test for me. So far, the majority of my large races have all been in big cities, with plenty of distractions to take my focus off the distance. Not this one. It begged the question: do I actually enjoy running for its own sake? Or am I just a victim of the bells and whistles that organizers ring around you, “tricking” you into paying to run? 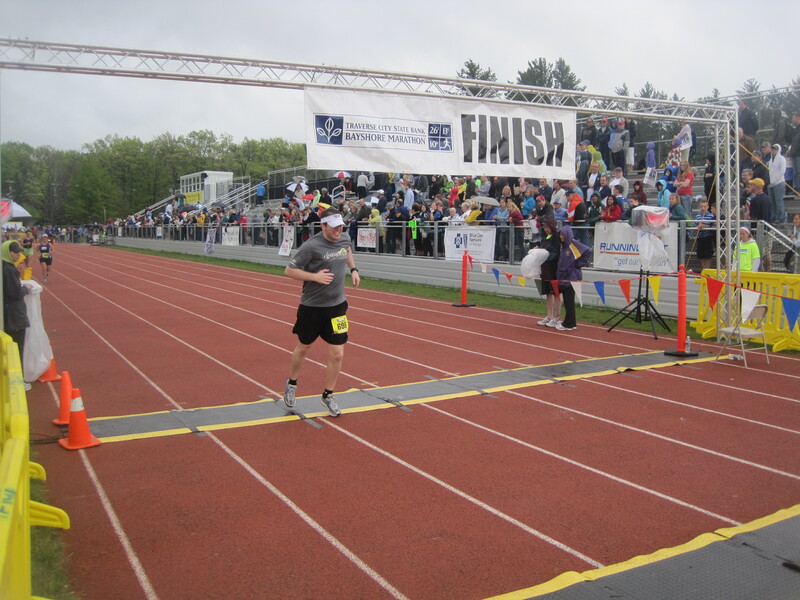 I ran the first half at a controlled and restrained pace, reaching the half marathon mark in 1:52:10. This was a bit slower than the first half of my 2010 Chicago time, but the breezy temperatures in the 50’s were keeping me stable and my energy stores were high. But that’s the thing with the marathon distance – until you have run a handful of them, you have no idea how your body will behave in between miles 16 and 26. There’s too much to consider – your overall fitness, taper plan, monthlong nutrition, hydration strategy and scores of other elements come together to either make or break your run. Every time I would fantasize about getting a fast time, I would pull myself back down to reality and repeat the mantra: respect the distance. But I was feeling too good at mile 15. So I decided to take a bold risk and speed up. And it paid off. This was the race where everything clicked. Between miles 16 and 26, only two people passed me. I kept accelerating, watching my overall pace on my Garmin decrease with every mile marker, every turn revealing more and more enervated runners who were on their way to hitting that dreaded wall. At mile 23, there were more walkers than runners, with their hands resting dejectedly on their hips, muttering their own mantras to themselves to try and keep going. But I kept my pace up, all fear of bonking having dissipated like the morning rain. Mile 25 approached and my legs began to turn to lead, but I powered through. It wasn’t until the 0.2-mile finale that several runners mustered up the energy to sprint towards the finish. But I didn’t have to. The clock read 3:40:59. I had obliterated my marathon personal best by over 22 minutes and nothing, except maybe getting raptured at the last minute, could take that away. I wasn’t the only one to PR, with Otter finishing in 4:34:54, lowering his marathon benchmark by about ten minutes. With these accomplishments beating our chests in the shape of an impressively heavy medal, we left the post-race area and sought out a suitable burger joint. After downing the North Peak Brewing Company’s signature burger and two of their craft ales, we went to Buffalo Wild Wings to watch FC Barcelona defeat Manchester United in the Champions League final. That night we stuffed ourselves with Mexican food, completely undoing the day’s athletic feats. If we were close to breaking even on caloric consumption, that dinner sealed the deal … and probably put us over the top. By a lot. 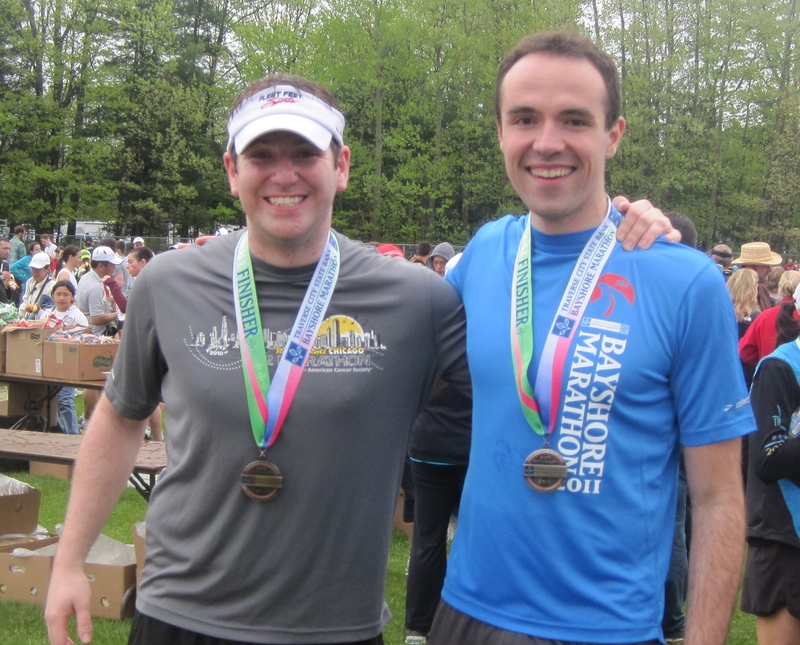 To be honest, I’m not sure what I learned during the Bayshore Marathon. My substantial PR has clouded my ability to derive any meaningful lessons from the experience, namely, did I enjoy running this distance, so far from a big city or gimmicky location? Did I only “love” the run because every runner that I passed was a stroke to my ego? Had I run a 4:10 instead, would I still have enjoyed the consistent, almost repetitive route? Maybe. Tucson was as monotonous as it can get, but I still loved that race (though, in all fairness, I ran an impossibly fast time there too, so once again, my judgment is unreliable). It would sadden me a little to learn that I wouldn’t run or train without a finish line to reach. 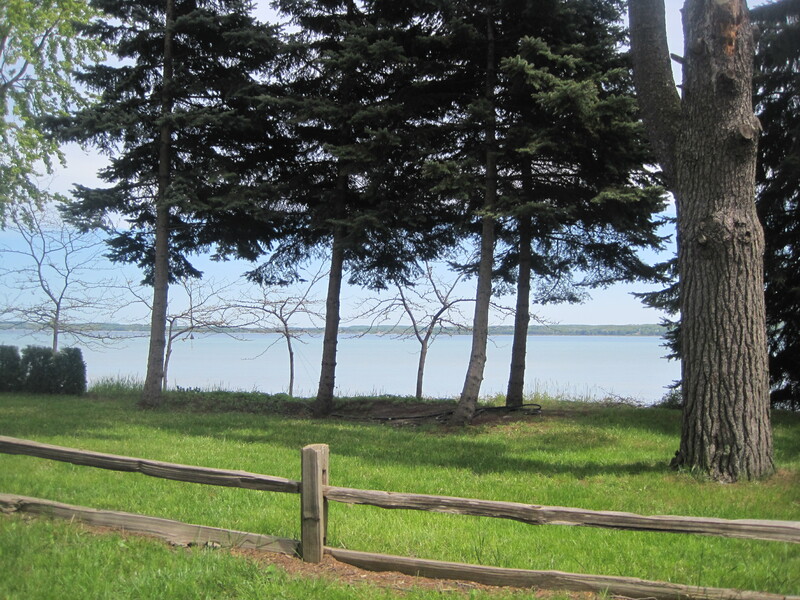 But one thing is certain – Traverse City is a beautiful destination and I’m glad it was the site for my Michigan race. I’m still not sure how Otter ended up there in 2007 and why he decided to return the next year. But I’m glad he built up just enough crazy to get out for a threepeat. And now, with this marathon under my belt, it’s time for summer. Congrats with your time! And what a fantastic plan. After all the states, you then need to do a marathon on each continent! !